Try a new Gluten Free Dinner Recipe every day this week! Oh boy. My relationship with Macaroni and Cheese goes so far back. It’s complex and intertwined with emotion. As a kid, Dad’s night to cook would mean he’d whip up a batch of the blue box dinner. He would almost always stir in cut up hotdogs. I’d squirt some ketchup on top and it was a beautiful thing. My grandmother made the most incredible, classic macaroni and cheese casserole with onions and crunchy bread crumbs on top. The corners would get crispy and the inside was gooey and it was heaven. She taught me how to make a béchamel based cheese sauce and years later I would wow my friends by whipping up a batch of mac and cheese at 3 in the morning after a night of heavy drinking. I never woke up with a hangover after that bedtime snack. I know grandma is proud – ha! 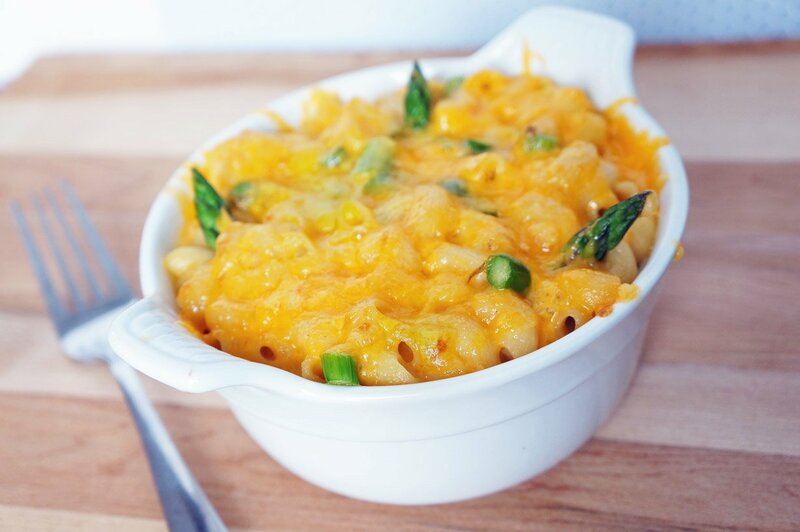 Now, as an adult, mac and cheese is the ultimate comfort food. It’s very rare that I allow myself the indulgence because it’s so delectably naughty but when I do, I do it full force, sinking into the creamy cheesey mess with wild abandon. 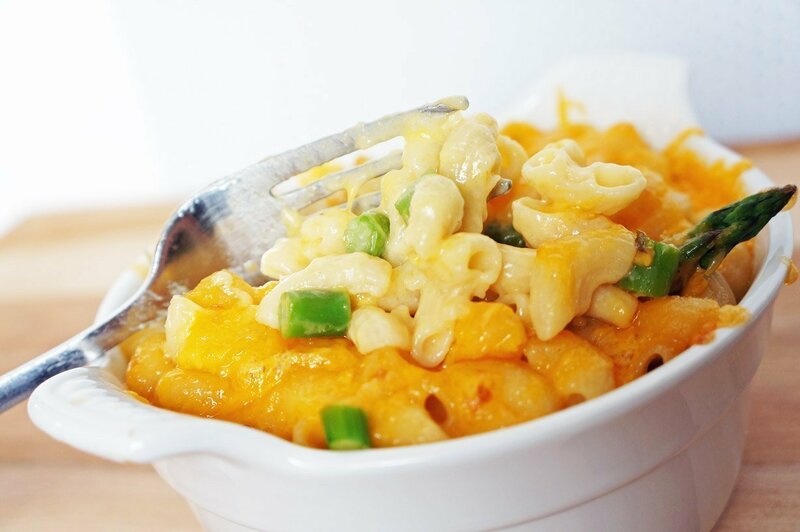 These days I make my mac and cheese gluten free and it agrees with my tummy much better. It’s still based on a béchamel sauce which is the important part if you ask me. As comfy as your grandma's recipe but gluten free. For the sauce, in a medium sauce pan heat olive oil and cook onion over low-med heat until soft and translucent. Whisk in flour and garlic powder to form a paste. Add milk, stirring to incorporate paste and bring to a simmer. Stir often until mixture has thickened slightly. Add cheese and stir until well incorporated. When pasta and asparagus have cooked (I do it in the same pot, but the asparagus will take less time so I add it in when pasta is nearly done) strain and stir together with the sauce. Now you can make some choices - you can portion out into ramekins, or into a casserole dish and top with extra cheese and bake at 350F until bubbly and the top has browned slightly. Or you can just serve as is. When I make this for the kids, I omit the onion and veggies. Not because they won’t eat them….but because this is usually a quick, no time to make dinner, dinner so I cut corners to make it fast. I also don’t top it with extra cheese and bake it because that adds time too. Instead I just mix the noodles with the sauce and serve. It’s surprising to discover that it doesn’t take much more time to make than your old boxed dinner. Just one extra pot! 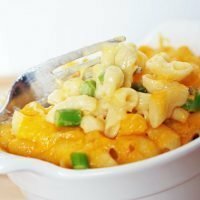 I hope you try this and dive back into the depths of your own mac and cheese memories. Enjoy.